BOCA RATON, FLORIDA (July 13, 2015) – New Water Capital L.P. (“New Water”) announced the first and final close of its inaugural private equity investment fund, New Water Capital Partners, L.P. (“NWC I”). 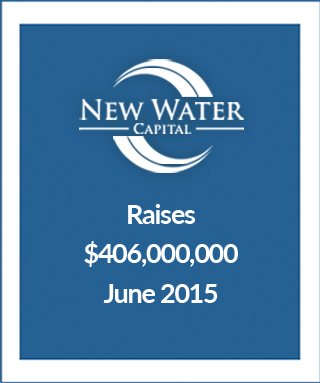 New Water began fundraising in March with an initial target of $250 million and closed at its hard cap of $406 million. New Water makes control investments in North American lower middle market companies with revenues of approximately $30 million to $300 million in consumer products, retail, and industrial manufacturing and services. NWC I will focus on special-situations investments, such as turnarounds, underperformers, corporate carve-outs, and companies in transition. New Water is led by its partners Jason Neimark, Brian McGee, John Disa and Mark Becker. New Water’s collaborative transaction and operating model is built specifically to support companies in special situations with unique business and operating challenges. New Water’s portfolio companies will leverage its deep acquisition, financing and operating expertise in order to achieve their strategic objectives. Capstone Partners served as exclusive placement agent for NWC I and Proskauer Rose LLP provided legal counsel.